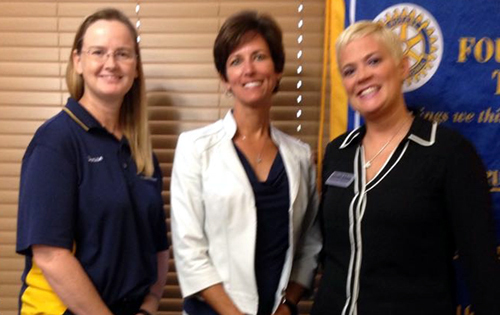 On October 13th 2015, Courtney Moyett, Community Health Advocate for the Tobacco Free Partnership of Okeechobee County and QuitDoc Foundation was the honored guest speaker at the Rotary Club of Okeechobee’s weekly meeting. Courtney educated the club on the new goal areas for the tobacco prevention program in Okeechobee County. QuitDoc Foundation was awarded a grant in 2012 by the Bureau of Tobacco Free Florida to provide tobacco prevention programs in Okeechobee County. For the past 3 years, these programs have included youth prevention, such as the Students Working Against Tobacco (SWAT) Clubs at each middle school, high school, tobacco free workplaces, smoke-free multi-unit housing, and measures to counteract marketing of candy flavored tobacco products and retail advertising. QuitDoc Foundation also facilitates the Tobacco Free Partnership of Okeechobee County, which includes partners and stakeholders in the community. This year marks the beginning of a new fiscal year and new areas of focus for the tobacco free program. The tobacco program has partnered with Counter Tools, a non-profit provider of proprietary software tools, training, and technical assistance to facilitate policy changes affecting tobacco marketing in the retail environment. This partnership will allow local tobacco prevention advocates to conduct surveillance of retail stores in Okeechobee County that may be advertising tobacco to youth. The Okeechobee County program will continue to focus on tobacco free worksites, helping local businesses adopting tobacco free policies. Okeechobee County has several new areas of focus for the 2015-2016 program year such as creating smoke free policies for venues such as sporting events and decreasing second hand smoke that children are exposed to while in a vehicle. Another new area of focus this year is smokeless tobacco, including smokeless use at public places, events, and youth sports leagues. The goal is to reduce youth use of smokeless tobacco throughout Okeechobee County, a leading cause of oral cancers, gum disease, and tooth decay. SWAT Clubs continue to thrive in Okeechobee County, with 4 active clubs this program year. Club members have already begun the year’s activities, with club recruitment activities held on campus. The Okeechobee High School SWAT Club president attended a statewide training with the Florida SWAT Program at the end of September to discuss tobacco trends and learn and build on their leadership skills. For more information on the tobacco free program in Okeechobee County, visit www.TFP-Okeechobee.org or call 863-801-8277.